Provide beautiful wood ducks a sturdy and lasting home with the Coveside Wood Duck House. These waterfowl prefer a hole or cavity for nesting, but are not able to excavate their own. Offering them a manmade unit brings a suitable nesting area to any setting easily, and this specifically designed roost will perfectly meet all their needs. A slanted roof at the top of the deep home protects the nest from rain, and drainage holes on the base help it stay dry and fresh. Ventilation holes at the top of the shelter keep it comfortable, aided by the thick, white pine construction. The rough hewn interior of the house, along with an attached ladder on the inside front panel, make it easy for ducklings to climb out of the box when ready. For added convenience, one of the item's side panels opens in two latched sections: the top for observation and the bottom for seasonal clean outs. The included bag of wood chips helps wood ducks make their nest, creating a stable bed for the eggs. The wealth of features creates a wonderful shelter, and one of the most durable and innovative available. Place the item on a post for a stable display, and situate it near water for the safety of the wood ducks. 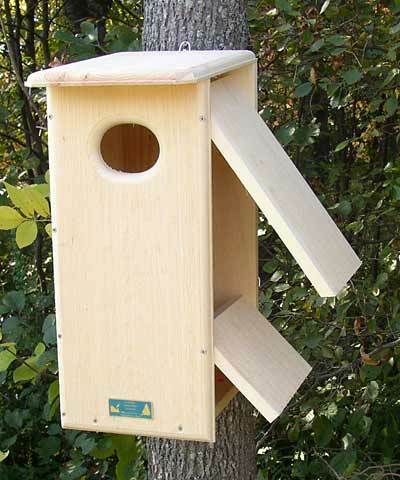 Enjoy waterfowl as residents near your pond or lake in this Coveside Wood Duck House. Some assembly required. Made in the USA.